It’s not every day you get lucky enough to witness a real-life superhero in action. 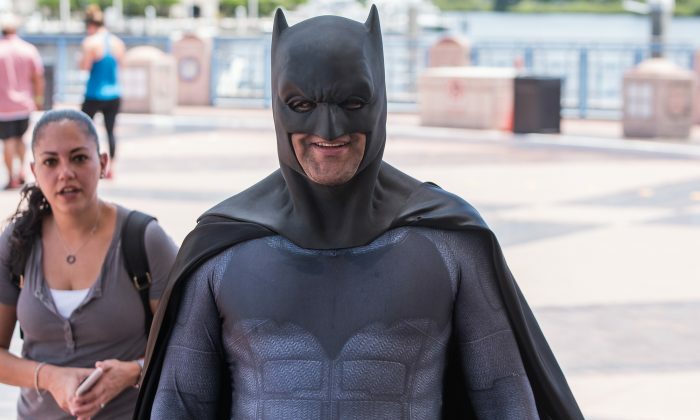 But one Canadian woman recently got front-row seats when she captured a video of a man dressed as Batman, who attempted to assist police in Kelowna, British Columbia. In the video, Parent can be heard excitedly saying, “Is Batman here to save the day?” while filming him cross the street in full regalia. Parent was driving home from a friend’s house when she spotted the “caped crusader” pull up in front of her. Seeing an opportunity to potentially capture something special, she did what anyone else would do and started filming. Batman stepped out of his own version of the “Batmobile” and approached the police line, where officers had drawn their guns, and tension was high. After offering them his services, he was seen being turned down immediately, with police stating that they had everything under control. Police officers were responding to a domestic incident on March 22, 2019, and were on high alert as they believed at the time that one suspect was armed. Paul MacDougall, an officer with the Kelowna Royal Canadian Mounted Police, told Narcity: “It was an undisclosed event and the info was unknown at the time and taken seriously. The risk to public safety was unfolding. It can unfold in many ways and shots could have been fired. Our advice to the public was to stay away from the area. “They are putting themselves at risk by approaching the scene. They are also risking the safety of police,” he further added. After being rejected, Batman walked back to his vehicle, which wasn’t the impressive Batmobile we’ve all been acquainted with but a black pickup truck with a decal of the superhero’s iconic logo plastered on its back. Perhaps Batman traded in his signature ride for something a little less conspicuous. According to Narcity, an event called the Kelowna Fan Experience coincided with the incident. The event had attendees dress up as pop culture icons and well-known comic book heroes. MacDougall said the wannabe superhero might have been in town for the event. While the incident may have many snickering, police weren’t so quick to laugh. They take situations like these very seriously. Had something gone terribly wrong, this little stunt could have had dire consequences. When it comes to interfering with police work, the Kelowna RCMP have one policy: don’t get involved even if you are a famous superhero. This isn’t the first time a man dressed as the Dark Knight made news in an attempt to fight crime. In 2016, the Telegraph reported a story about a man dressed as Batman being photographed chasing off a “killer clown” in Cumbria, North West England. The masked man was responding to the increased incidence of people dressing up as clowns and scaring people in the area. Who knows when Batman will show up again to lend a helping hand? Hopefully, for his sake, his efforts to help will be a little more successful next time. Not to mention less humiliating. Happy Birthday to the Batman himself, Michael Keaton!